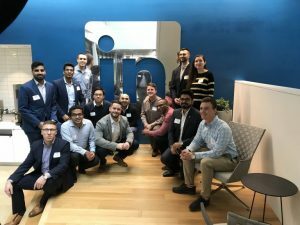 As many students traveled home for the recent holiday break, 14 Eli Broad College of Business Full-Time MBA students headed out West on Dec. 9-12, where they spent their time networking with technology companies in Northern California as part of the first-ever Broad MBA Tech Trek. “The purpose of the trip was for MBA students to learn more about technology-focused companies on the west coast, to visualize what it would be like to live on the West Coast, to better understand career opportunities in the technology space, to connect with MSU MBA alumni on the West Coast and to have an experiential project during the trek,” said Broad College Director of Career Management and Employer Relations Marla McGraw, who accompanied the group of Broad College students on the trip. The trip consisted solely of MBA students as it was planned and funded by the MBA Program Office. In their time they visited Silicon Valley cities such as Santa Clara, San Bruno, Mountain View, San Jose and Foster City, where they attended events, including one with Broad College MBA alumni. McGraw said that students also met with people from companies such as LinkedIn, Walmart eCommerce, Zoox, and Flex, to name just a few. While many would find a perk simply in traveling out to California, these MBA students got much more out of being able to network not only themselves but also Michigan State University with companies from all over the United States. These connections are as useful as they are insightful, and could ultimately jump-start many of these students’ careers. Accompanying the students was Wayne Hutchison, director of the Full-Time MBA program, who also did the lion’s share of planning and preparation for the trip. Although this event was meant to spark interest and better connect students to potential future employers, it also provided the hosting companies with benefits as well. “The tech companies got a chance to see the MBA program talent first-hand and brand their organization within a great MBA program as well as generate interest in their career opportunities,” McGraw said. With this trip in their back pockets, the next step that lies ahead for the students who attended is to use their new connections to find the right career that fits the vision they have in mind.